Precious saints, we would like to thank you all for your prayers and for remembering us. Brother Lazaro and his wife were here with us last week. For the first time, they brought the first set of Brother Branham’s messages which they printed themselves in Bariloche. 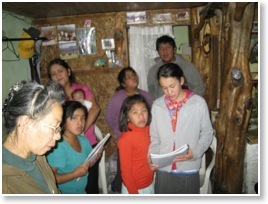 We had special services in a small building that the municipality allowed us to use. This gave us the opportunity to sit down with the believers and to organize Brother Lazaro’s future visits and some of the order for the church, musicians, and other matters. 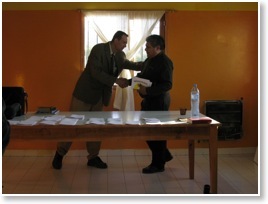 Brother Lazaro is already preparing his trip to the north of Argentina, and for the first time will be bringing literature from his own print station to many who have very little access to Brother Branham’s messages. Before he leaves, he will make another trip here to Trevelin, Argentina. The Lord has been very good to us, giving us direction and guidance in times where we really need to make decisions. We will be preparing our return to Canada in about two to three weeks. We are looking forward to participating in the services again, and to continue the fellowship as always. Once again, we appreciate the prayers in these very difficult times where chaos and confusion is everywhere. For the children of God, we have a vision and direction which is to walk on His Word. God bless you and the Lord always keeps you in His love and peace.